Product quality is the group of features and characteristics which determines the capacity of the product to meet the specification requirements of a standard or of a customer. It is often defined as ‘the ability to fulfill the customer’s needs and expectations’. It is also sometimes defined as ‘meeting specifications at the lowest possible cost’ as well as ‘delivering the value that a customer derives from a product’. Product quality needs to be defined firstly in terms of parameters or characteristics, which vary from product to product. The quality of the product can be controlled during its manufacturing and it makes the product free from deficiency and defects. A specification is the minimum requirement according to which the producer makes and delivers the product to the customer. In setting specification limits, the following is required to be considered. Brand related requirements of the product. As described above, the product quality is the ability to satisfy the stated needs. From this definition, product quality can be described by nine dimensions or characteristics. These nine dimensions are as follows. Performance – It is the product’s primary operating characteristics. Product is to give expected performance during its use. Product features – The product is to meet the requirements of its features. For example a rebar is to have two longitudinal ribs and several cross ribs at specific intervals. Reliability – It is the probability of the product surviving over a specified period of time under specified conditions. Conformance –It is the degree to which the physical and performance characteristics of the product meet the requirements of the standards. Durability – The amount of use one can get from a product before it needs to be replaced. Serviceability – The ease with which the product can be serviced or repaired. Aesthetics – It represents how the product looks and how it is aesthetically pleasing. Safety – It is assurance that the product is safe during its use and it does not fail prematurely. Perceived quality – The product fulfill the requirements of its brand created though brand image or brand name. In designing the product, the capacity and capability of the processes and the equipments is to be kept in mind. It is also necessary to maintain a balance between cost and value realization. The clearer the specification, the better is the possibility of creating and delivering quality products. Further the product specifications are required to show the quality standard demanded by the customer in clear and precise terms. Every dimension is to have realistic tolerances and other performance requirements are to have precise limits of acceptability so that the product can be manufactured strictly according to specification. The quality of a product is made up of many individual characteristics. These are (i) chemical composition, (ii) physical properties such as dimensions and dimensional tolerances, macrostructure, microstructure, and surface finish etc., (iii) mechanical properties such as yield strength, tensile strength, reduction in area, hardness, impact strength etc., (iv) electrical properties, (v) surface defects, and (vi) internal defects. For some products functional qualities as well as effects on service also constitute important characteristics. Since the organization is required to maintain reputation as a trusted source of high quality product hence management of quality of the product is very important for the organization. In an steel organization where a large number of units are working in conjunction with each other and where there are a large variety of processes taking place simultaneously at all the times, producing a number of products, the management of the product quality is quite complex. However if the product quality management is done efficiently, it ensures consistent product quality which not only adds to the organization’s image but also delights the customers. 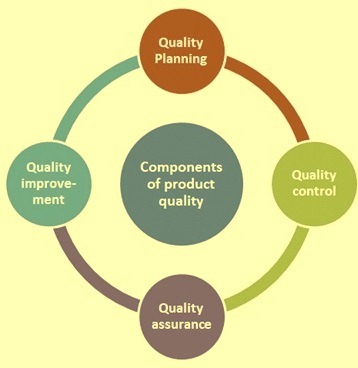 Product quality management includes the following four major components (Fig 1). Quality planning – It consists of continuous efforts which are made to track defects and determine the causes behind them. Quality control – It is a procedure or set of procedures intended to ensure that the manufactured product adheres to a defined set of quality criteria or meets the requirements of the customer. It is the control exercised during the process of the manufacture of the product in order to reduce the production, repair and warranty costs through defect tracking and repair. It consists of monitoring of the process parameters as well testing and inspection of the raw materials, intermediate products and finished products. Quality assurance – It is defined as a procedure or set of procedures intended to ensure that a product under manufacture will meet the specified requirements. It consists of the process of providing controls during the manufacturing of the product to assure the customer that the product which he is receiving meets the specified requirements. It also consists of the effective tracking of problem reports and customer complaints in an effort to resolve the queries in a timely fashion. Quality improvement – It consists of the efforts made towards quality tracking, process improvements, customer complaints, and other quality related information and manufacturing problems with an aim to improve the product quality and reduce the product rejection rate. Quality improvement ultimately helps in the customer relationship management. If a product bears a recognized mark such as a national or regional certification mark or international mark (e.g. an International Electro technical Commission (IEC) mark), this gives an assurance to the customer that the product meets the specifications to which the mark corresponds. In other words, the product is considered by the customer as a ‘quality safe product’. ‘Product certification’ is defined as ‘a procedure by which a third party gives written assurance that a product, process or service conforms to specified requirements’. The product certification authorities normally permit the use of a mark on the product to demonstrate that the product meets a defined set of requirements and has characteristics that are usually specified in a standard. The mark is normally found on the product or its packaging; it also carries a reference to the number of the relevant product standard against which the product is certified. Ideally, a product certification mark is to demonstrate to the customer that the product meets the generally accepted standard for that product. The organization with an effective product quality management gets the product certified from the standards organization so that it can stamp the product with the emblem of standards organization and applicable standard. The management of product quality is done in stages. There are usually four important stages in the product quality management. These are (i) management of the quality of raw materials and input materials, (ii) management of the manufacturing process or process control, (iii) testing and inspection of the product, (iv) packing and loading of the product on the delivery vehicle. The first stage consists of the control of the quality of the raw materials and other input materials. These materials need to be tested and inspected before their use in the product manufacturing process so as to ensure that they meet the specification requirements. Product quality is adversely affected if the raw materials and other input materials used are not as per the specification. For checking and acceptance of the quality of raw materials and other input materials usually testing methods and inspection procedures are employed. The organization is required to have the facilities for carrying out such inspection and testing. The second stage in the product quality management consists of control of the manufacturing process. This stage is normally called process control, which is carried out by monitoring and adjusting several process parameters to ensure that the process of manufacture proceeds as per the set process requirement and does not go off its path. In some cases it becomes often necessary to inspect the in-process material for ensuring that the process is on the track. In-process inspection aims to prevent products of unacceptable quality from being manufactured. It provides data for making decisions on the product (accept or rework or reject), as well as on the process (run or stop). In-process inspection can take the form of (i) first-piece inspection, (ii) operator inspection, (iii) last-piece inspection, or (iv) stage inspection. The third stage in the product quality management consists of testing and inspection of the manufactured product. It is done after manufacture has been completed, with the object of making sure that the products are satisfactory for dispatch to the customer or maybe to another department for the next operation. The testing of the product is done by testing of the representative samples with the help of the testing equipments. In some cases where the product cannot be destroyed then non-destructive testing methods are used. In case of inspection of the product, it is done either visually or with the help of the inspection equipments. The testing and inspection of the manufactured product is done to ensure that the product conforms to the specification requirements with respect to chemical, physical and mechanical properties. Products which do not meet the specification requirements are segregated either for downgrading or for rejection. The fourth stage in the product quality management consists of its packing. The product packing plays a very important role since proper packing ensures that the product quality does not deteriorate during its handling and transport post manufacture till its use at the customer’s premises. During the manufacture of a product, there are several factors which can have an influence on the product quality. These factors are described below. Approach of top management is an important factor in maintenance of the product quality. Manufacture of the product with consistent product quality need active support of the management since the maintenance of product quality results into substantial expenditure during the monitoring, testing and inspection processes. Management need to show their active support by delegating adequate powers to the quality control personnel. Production processes such as primary and secondary steelmaking, casting, rolling, heat treatment, and cleaning and coating etc. play an important role for ensuring the product quality since it is the process which normally introduces defects in the products especially when the process goes out of its normal track. Equipment health is another factor which is responsible for producing defect free product. Equipment which are not properly maintained or replacement parts of the equipment if not changed timely introduces defects in the product during its manufacture. Level of automation is another important factor which has an important role to play in the maintenance of the product quality since manual operation can introduce human errors which can influence the product quality. Material tracking plays a big role in the maintenance of product quality. It is necessary to exercise suitable control over the movement of the materials during production in order to avoid mix up of different materials during the process of manufacturing of the product. It is done by proper labeling of different materials during the production process. Without proper material tracking there is mix up of grades and same product can have different chemical compositions which may not conform to material specification. Stage inspection is a step which helps in the detecting whether the manufacturing process is going off track or not. In case the process has gone off track then it becomes necessary that corrective actions are taken before the manufacturing process is continued. Availability of equipments and instruments for testing and inspection is necessary for the management of product quality. Without the testing and inspection of materials in different stages of manufacture of the product, the management of product quality becomes only superficial. Well laid procedures for production as well as for testing and inspection contributes to the good management of product quality. These procedures also help in systematic working in the organization which in turn helps in the better management of the product quality in the organization. Employees’ knowledge, training and behaviour are the major factors which aids in the maintenance of the product quality. For the organization to reach an adequate standard of quality, the people at all levels must cooperate actively. This means continuous employees’ development. The Japanese ‘revolution in quality’ is largely the result of comprehensive education and training aimed at all functions and levels, from the top management to the worker level. Shop discipline is another factor which determines the employee’s behaviour at his duty post and hence it influences the product quality. Markets and customers have a big role to play in the management of the product quality. Quality conscious market and customers forces the organization to have a tight control on the product quality and in turn helps the organization to have a streamlined management of the product quality within the organization. Economics – Finally it is the economics which ultimately determines the management system for the product quality. While managing the product quality, the organization is to ensure that unnecessary costs do not get loaded on the product and make them uneconomical to produce. Fast and consistent corrective action and preventive action processes are central for the maintenance of an effective management of product quality as well as for maintaining regulatory compliance with the applicable standard and improving the quality of the product. This is very essential if the organization is not to struggle for establishing an effective product quality management system. Fundamental elements of the product quality management include the following. Products complaints – They provide early warning signals of product quality issues in the customer’s end and hence are to be used to identify the deficiencies in the product quality management so that the same can be addressed. Product assessment and trending – It is the proactive assessment of product quality attributes across the manufacturing process and it needs to be closely monitored. Product quality personnel – they are single point of contact for the product quality with the key stakeholders. They provide a link in the organization between manufacturing personnel and the customers. Routine assessment of product quality control plans is necessary to address trend. Quality control testing network support needs a harmonized approach to test method execution and support. Stability in the quality and supply of raw materials and other materials used in the product manufacture is needed for product quality management stability. Analytical methods of management are required to ensure that they meet the standards requirements so as to provide the needed consistency to the product quality. Effective use of quality control tools helps in the management of product quality. The seven quality control tools are (i) process flow charts, (ii) check sheets, (iii) graphs, (iv) pareto analysis, (v) cause and effect diagrams, (vi) scatter diagrams, and (vii) control charts.